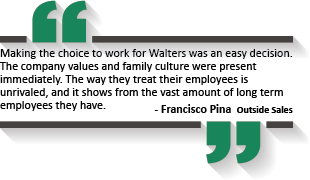 At Walters Wholesale, we believe our people and culture are what makes our company so special. Building upon our founder Les Walter’s and his son John Walter’s vision we continue to grow and expand. Walters is a family run company, with the interests of its customers and employees at the center of all business operations. Our environment encourages employees to work hard, and push themselves in their careers. We provide many training and development opportunities to allow employees to learn new skills, and improve upon existing ones. We believe in providing employees with a friendly, safe working environment, paired with a healthy work-life balance to leave you fulfilled in all areas of your life. We pride ourselves on the longevity of our customers and our employees! At this time, internships are not available. Walters Account Rep and Management Training Program. 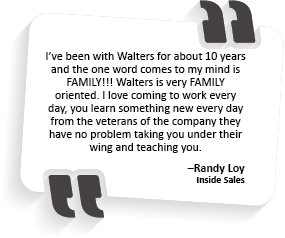 At Walters Wholesale, we believe that in order to be the best in our industry we need to have the best employees. We take great pride in investing in our staff and in particular, offering a great program like our Account Rep and Management Training Program. We offer a unique opportunity for trainees in the program to learn and gain the basics of product knowledge, customer relationship building and industry experience which will all accelerate their ability to launch their career in electrical distribution. The Account Rep program is approximately 18-24 months and throughout that time we provide you with a variety of different training methods. Walters believes that efficiently trained employees truly are the backbone to a company's success. * Inventory displayed is accurate as of 04/25/2019 07:40 PDT.